In this article, I will show you how to upgrade the QnA Maker service and associated Azure resources using the Azure portal. Also, will present the demo video for the same. 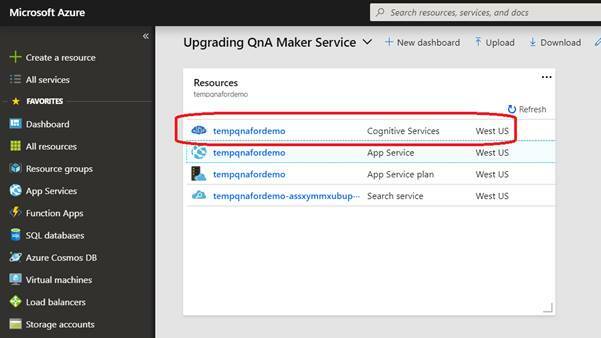 In this article, I will show you how to upgrade the QnA Maker service and associated Azure resources using the Azure portal. Also, I will present the demo video for the same. There comes a scenario where we need to upgrade our QnA Maker service associated with QnA Maker knowledgebase. QnA Maker service provides to tiers as part of management pricing tiers. Free Tier – Allows up to three managed documents with the size of 1 MB each. Standard Tier – Allows unlimited managed documents. We cannot add more than three documents to knowledgebase with associated QnA Maker as a free pricing tier. In such cases, we need to go for upgrading our QnA Maker service. I have created a knowledge base with three URLs as an Input source. Here, when I tried to add one additional input source, consider a public URL, this will throw an error mentioning the pricing tier denial of adding more than three input sources. 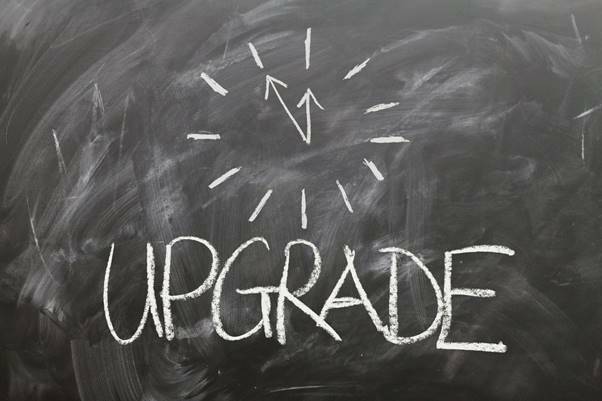 Upgrading QnA Maker can be achieved with a few simple steps. Go to Azure Portal => Open up QnA Maker resource blade. 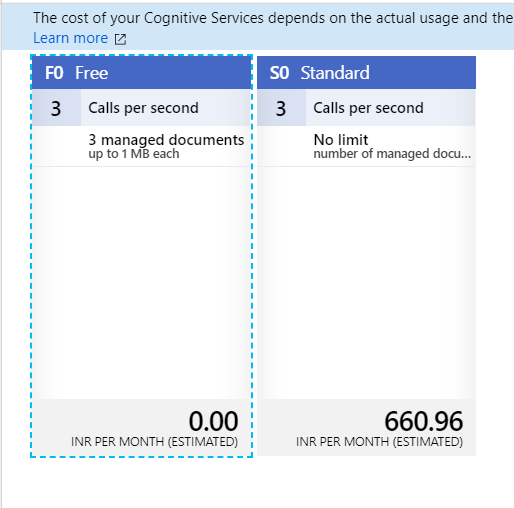 Under the click ‘Pricing Tier’ option under resource management, here, among the two pricing tiers, select the standard tier by hitting the option. Within a few seconds you will be notified with the update. Now navigate to QnA Maker Portal and try to add the fourth URL. 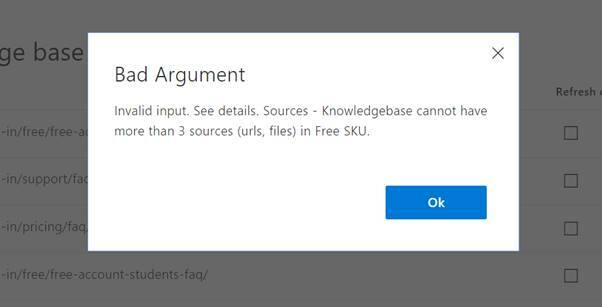 You will see the URL getting added as the input source, and now knowledge base will allow more than three URLs as an input source for the knowledge base. In a similar fashion, as we all know Azure App is also created when we create QnA Maker service. We can also upgrade the Azure Web App associated with QnA Maker service. 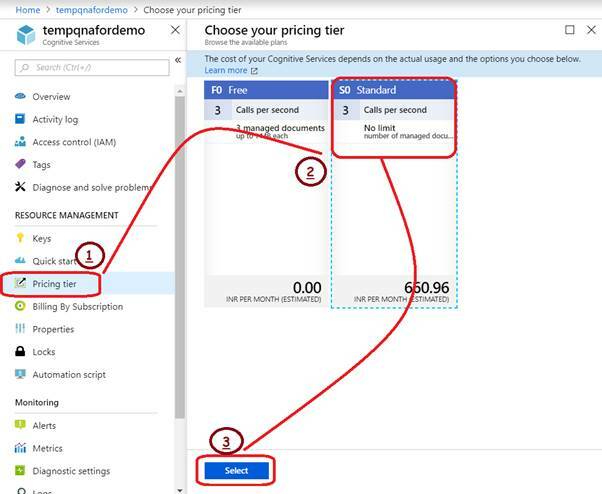 By a few simple clicks, you can upgrade your QnA Maker service and associated Azure resource and make your Bot more intelligent and efficient for use.